My fiance, Mark, and his colleagues were invited to Seattle for a briefing on new products from a leading software company. For some reason, Mark really likes having me around all the time, so he invited me on the trip. In my usual fashion, I spent a few weeks searching the web for life-changing, bank-breaking activities in the area that Mark would have no interest in because apparently I can’t just go to zoos, museums and the tallest building in a city to enjoy travelling. GO BIG OR STAY HOME, I say. We arrived with two of his colleagues in the afternoon and went straight to his Seattle office, which was attached to a mall of sorts. Mark had suggested that I sit in the conference room and work, like his colleagues would be, while he had a meeting. I thought this was a terrible idea. Because 1. I have a hard time with meeting people in a professional setting, (especially when I don’t have to) 2. My work was already done, that’s why I was on vacation and 3. I was 2,200 miles away from where I live and EXPLORATION. He had suggested I shop around the mall instead, and I politely HELL YEAH’d my way away from the business elevators and toward the shopping escalators. I went into one store but shopping generally has one of three effects on me: it leaves me bored, guilty, or hating my body. Plus, it was a beautiful day. I stepped outside to see if anything more exciting would pop up, and protruding out of the distance was the defining characteristic of Seattle’s skyline, the Space Needle. It’s huge, so it had the illusion of being somewhat nearby. I headed in it’s general direction, without too much thought about my needing to be back promptly after his last meeting. 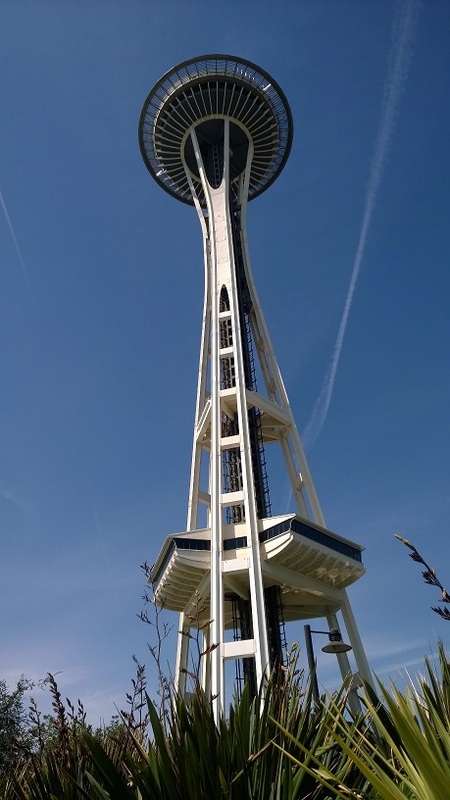 After a few wrong turns into a lot of construction, I reached the base of the Space Needle. It’s pretty grand, though you can’t marvel at all of it’s Jetson-like mid-century-modern glory from this angle. I didn’t have the patience or the time to make the trek to the top-what’s a view of the Seattle skyline without the Space Needle in it, anyway? 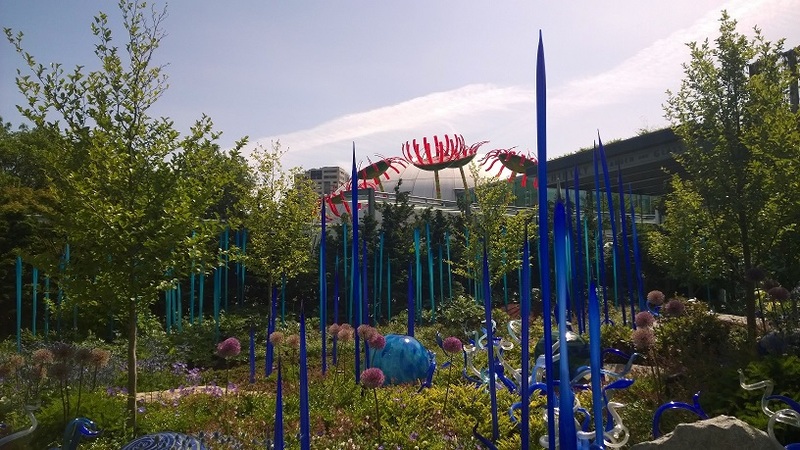 As was trying to get a worthwhile photo, I stumbled upon the Chihuly Garden. 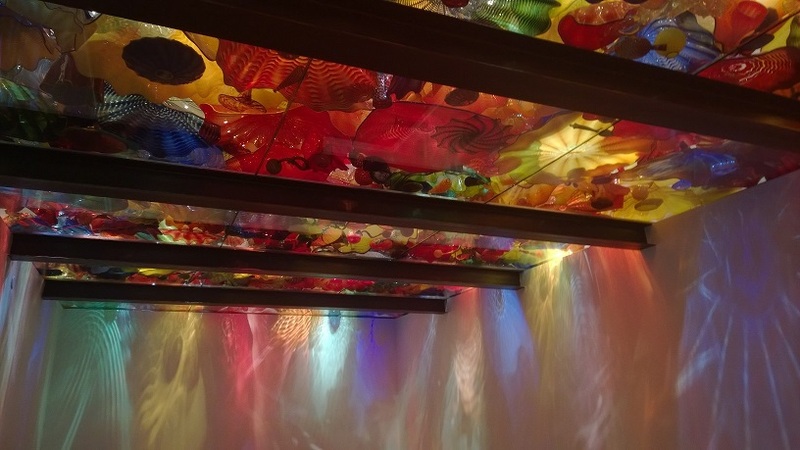 I had signed up to do a glass blowing class for the following day, so it just made sense for me to check it out the works of a world-renowned glass blowing great. Sometime around my fourth loop around the gift shop, I received a text from Mark asking me if I was done shopping, because he was just about done at the office. I [politely] shoved what was currently in my arms toward the nearest cashier, and set out to make the trek back to where I was supposed to have been the entire time. Dinner ended up being a great time: free food and wine, plus more conversations about relationships, YouTube videos, legalization of marijuana in the state of Washington, and Team America: World Police (which all seem to be along the same lines, now that I mention it) than about which coding languages one preferred and other narfy things. PHEW. SAFE. ← Yesterday, Tobias turned 6.